I return from my trip to Spain different than when I left. I heard over and over how amazing of an experience study abroad would be, how I would make some of the best friends I would ever have, and how I would create memories that last a lifetime. I was skeptical at first–how could every single person have such a wonderful time without at least one complaint? I was skeptical during the trip as well. Sure, I was abroad. But I was living my life exactly how I would have if I were at home, right? Wrong. It would take me until now, a week after my return, to realize that. And I learned so many lessons abroad. I opened my mind and let the things around me influence my thinking processes, my judgments, my take on the world around me. It was like my trip was a miniature lifetime–I was born in Spain, I became comfortable and grew up in Spain, I went to college in Spain. I was able to experience “real life” in this utopian, stress-free environment. I went through hard times, but I also went through elation; there was so much good to out-way the bad that all-in-all I would rave to the next freshman class about how study abroad is one of the most amazing experiences of your life. I even hope to be able to tell my take on the trip to others who are interested. I want to sit them down, take their hands in mine, and say “do it.” I overcame hesitancies about money, living alone, and faith in order to make this experience real. And I would love to be able to ease the minds of others with the same hesitancies. My intention of this post was not to be vague, but to talk about a bit of the overlying themes and changes I saw in myself throughout my study abroad experience. I’m still me, but I feel wiser. Okay, so: Make sure you have around €10 in currency! It’s two brief train rides from the airport, so hopefully with these instructions, it’ll clear up any questions you may have and help you feel comfortable using the public transport for the first time. 1) Inside Barajas airport, after you come out of the Arrivals gate, turn right – still inside the airport – and, keeping to the left side of the walk-way, you need to walk about half a kilometre – following the Metro (underground) signs (a red, white and blue flattened diamond shape icon that says Metro) – you honestly think you’re never going to get to the Metro station, but you will! I promise! Use the moving pavements if carrying heavy luggage (like we were). After a long walk and having gone up an escalator to the first floor and along various moving pavements, the signs will tell you to turn left. After another 200m. on foot and on moving pavements, you arrive at the entrance to the Metro station which is down below. 3) Look for the blue and silver automatic ticket machines OR the kiosk with a real person selling tickets. In both cases select or ask for a single ticket to NUEVOS MINISTERIOS (“sencillo” or “ida”) WITH AIRPORT SUPPLEMENT. (If you don’t buy the supplement now you’ll have to buy it when you try to get out of the exit barriers at Nuevos Ministerios – which is much more frustrating, because the ordinary “ida” ticket won’t let you through the barrier). You’ll need to pay €4.50 for the combined “ida”/”sencillo” ticket and airport supplement. 4) Get on “linea 8” (pink colour) from the Airport – direction: NUEVOS MINISTERIOS. Get in near the front of the train. After 4 or 5 stops, get out at “Nuevos Ministerios” walk forward – beyond the front of the train – FOLLOWING THE SIGNS TO CERCANIAS straight ahead of you (their icon is a tilted red “C” ) You are now in Cercanias!! This is a main hub for train transfers, I’m sure if you’re trying to go anywhere in the city you will pass through here. 5) Enter through the Cercanias barrier – straight ahead – then go up the escalator which is on the right behind you. Turn left at the top and walk straight to the end of the walk-way – following the signs to Sol, Atocha and PARLA. On the left is the escalator going down for Cercanias platform 8 and you want line C4, direction PARLA. Get out after 5 or 6 stops at LAS MARGARITAS – UNIVERSIDAD (careful there are 2 other stations in Getafe). You’ll exit onto Calle Madrid. Walk south following the street and you’ll come to a turnabout where the residence hall Fernando de Los Rios is on the left and a corner of the university being in front and to the right of you. Walk all the way around the roundabout so that you remain on Calle Madrid and follow it further. On your right will be the Campus of Humanities. If you want to go to the Business Campus, continue down Calle Madrid until the fence of the humanities campus ends. Go one more block and the fence for the business campus will start on the left. Follow it until you reach a gate, and there you are! Hope this helps any future students or encourages any visitors (: I’m going to go get lost trying to find other places so I can write detailed instructions to those cool places as well. I’ll keep you updated and anything exciting I find!! Ay dios mio, where do I start? The trip is already over halfway over and I can’t believe I have so little time left. I want to stay in Panama so badly; even a few of my classmates have decided to stay a few days after already. It’s just so interesting! The culture is so different. I remember us talking about the culture shock in the Study Abroad Orientation and I realize myself going through the steps described. I am still constantly fascinated by the culture, and it shocks me every time I realize a new part of their etiquette different from ours. I only just started delving into the “frustration phase” (I need more time!). I’m embracing it, though. If I’m working through my frustration, that means I’m learning, right? I bet the Panamanians are just as frustrated with me since I have to ask them to repeat themselves so many times. My language skills have grown so much. I can now haggle with taxi drivers, street venders, and even certain tourist shop owners. I can recite the conversation about why our group of gringos is in Panama for studying from memory. I can even tell a few hilarious puns in Spanish (the greatest step towards fluency in my book). 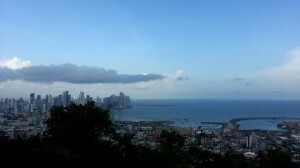 On top of Cerro Ancon the entire skyline of Panama City can be seen. This picture is from the top of Cerro Ancon, the only hill/mountain within city limits (took this picture during the hike I mentioned in my previous post). On top of the mountain is a Panamanian flag the size of a basketball court. You can see it from any point in the city, and it acts as a constant reminder of how proud the natives are of their country. We’ve done so many other excursions outside of the city as well. My favorite being a trip to El Valle, a quaint city located in the crevice of a dormant volcano. There we did zip-lining and swimming in a natural pool at the base of a waterfall. Tan hermosa! And this Sunday we have a plan to go to San Blas, and series of islands in the territory of the indigenous Guna people. They are Carribean islands and apparently the water surrounding them is like glass. I hope they have snorkeling gear to rent! I arrived in Panama City two days ago, but it already feels like I’ve been here for weeks. My group quickly got a feel for the area surrounding our hotel and campus, so we will be confident in taking risks to explore new areas. A few of us have already planned out snorkeling, zip-lining, and many many shopping trips for the three free weekends we have down here. I can already tell it isn’t enough time! So far, the most blatant cultural difference is the driving etiquette. Cabs are constantly trying to go as fast as possible in order to make the most money in a night. Horns are heard every few seconds as a form of communication between drivers. It is really interesting actually, how they use horns to alert others when they are passing, when they are turning, and when they are warning people trying to cross the street. The class set-up is also really nice. My Spanish 321 professor is also an acting chaperon on this trip, so I can have conversations with him in Spanish while walking around the city. His presence also pressures me in trying my hardest to not speak English with the locals or my fellow classmates as well. It is a great set-up and I know it’ll help me tremendously in learning more about the language and culture than I would have if he wasn’t there. Welp, I just realized we are leaving to hike a mountain in fifteen, and I have to go lace up my boots (it’s the rainy season). Hasta pronto!